My Demons of Consumption are unfortunately very autobiographical, although hopefully still very amusing (In lieu of novelty I will always fall back on self deprecating humor). My demons are always ready to party, always out for a good time. No matter how educated and informed I am, I still recklessly consume; it is my primary function. In any case, my demons have been constructed with parts of me  my hands and feet, and mouth  but also with parts of my son. A reminder that some behaviors have childlike motivations and are based in immaturity; also a reminder that he will inherit my follies if I do not pay attention to what he is learning from me. 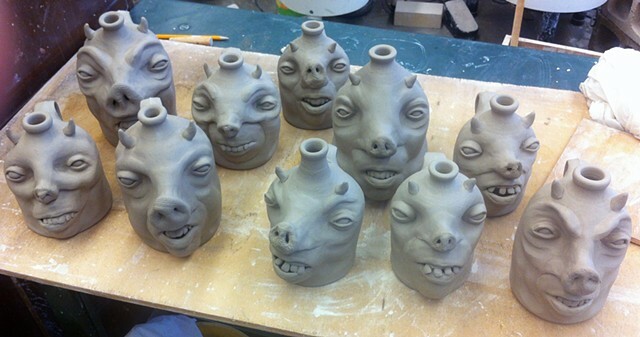 The whiskey facejug heads are not connected to the bodies, and can be removed and exchanged for other heads. These are process images; the bodies were thrown on the pottery wheel and altered.